Green Men were not the only things at Salisbury Cathedral that seemed a bit pagan when I visited a few weeks ago. 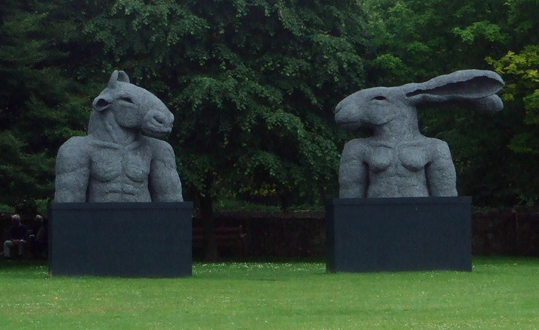 Both the grounds and the building are dotted with these amazing hare or rabbit women statues by Sophie Ryder. The one at the top is called Dancing Ladies and the name plaque said: "Three tall and slender feminine forms with soft luxuriant rabbit ears, invite the viewer to join them in their dance. The lady hare friends exude a joie de vivre." They reminded me of the Three of Cups in Tarot, which also shows three dancing ladies and indicates it is time for joyful celebration. 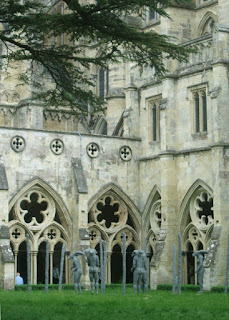 The series of statues to the right were in the cloister garden and showed several hare-eared figures among a circle of poles that reminded me of nearby Woodhenge. The photo at the bottom shows huge head-and-shoulder sculptures of a female hare and a male minotaur. The statues were all part of a temporary art display called Relationships. 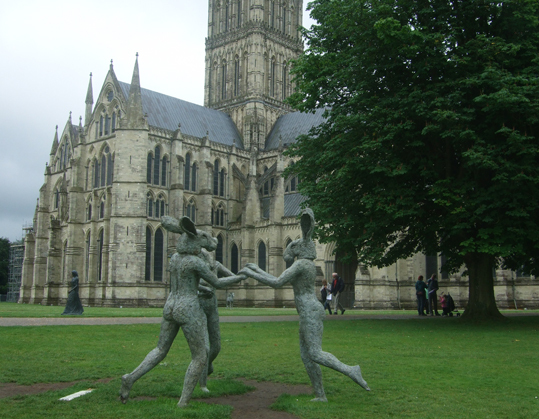 According to the Salisbury Cathedral website, the exhibition explored artist Sophie Ryder's own family interactions and relationships, at the same time challenging us to consider how we interact with each other and our own loved ones. It said: "She uses the hare-headed female figures and minotaur males both to portray those relationships and to disguise them, to render the emotions explored universal." The website also implied that the exhibition ended shortly after I visited, which is a bit of a shame because it was really impressive, moving and thought-provoking. An interesting bit here about Ladies shape shifting into hares.